While we were in Rio, BH suggested Albamar Restaurant after a tour downtown. I had never heard of it, and neither had our taxi driver who took us for a tour of the downtown, jumped out to ask a newspaper stand worker, and then cautiously followed some phoned in directions. Not sure what was so tough because it was right next to Santos Dumont Airport. In brief, this is a restaurant I highly recommend. We schlumpfed in there in sweaty outfits with backpacks and half-filled water bottles, and the tuxedoed waiters did not even blink an eye. This is a restaurant that has hosted numerous presidents, yet on the outside looks like a bad hurricane hit it recently. The three person elevator clangs and bangs up from a generic lobby to a white-table-clothed view of the port and the landing planes at Santos Dumont. But never mind all that, how about the food? Hands down, the best Arroz com Polvo (Rice with Octopus) I have ever had. 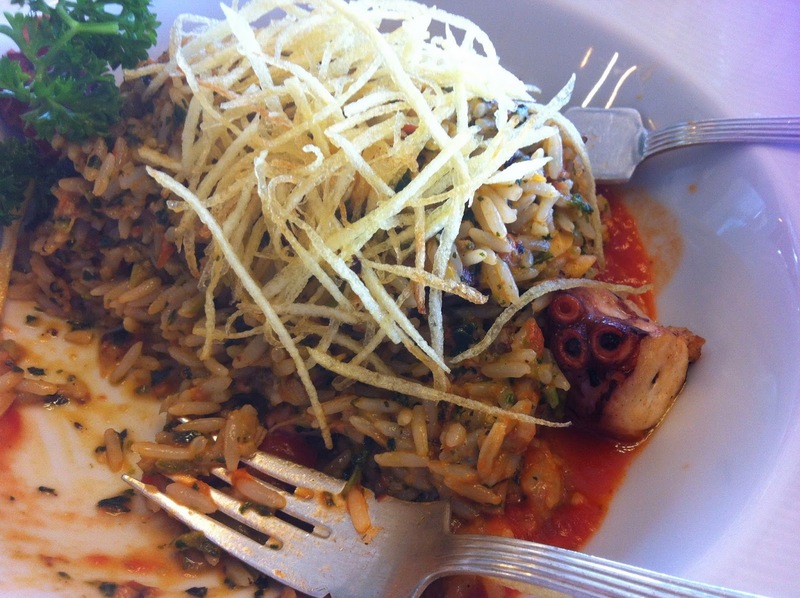 Hard to believe since I have also been to the mother ship of Octopus Rice which is in Cumuruxatiba, Bahia. The rice dish ordered by BH's kids was simply unbelievable as was the pasta and fish ordered by the little kids. Turns out the chef came over from the Copacabana Palace in 2009 and they need to hold on to this guy with all they've got. Amazing. Highly recommend. Albamar. http://albamar.com.br/. Don't be scared by its appearance.